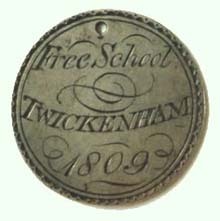 At a Vestry Meeting of 1809 it was resolved to combine the existing schools in one establishment to be run on the National Schools system, and to bring all separate funds under one account. It was also agreed that the school should be open to the children of all inhabitants of good conduct, whether parishioners or not, and that the Vicar, Curate, Minister of the Montpelier (Anglican) Chapel, and churchwardens should be permanent trustees, responsible for the regulation of the school and direction of funds, as well as for the appointment of the schoolmaster and mistress. The school was now back in School Alley, after its periods at East End and Crazy Lane (now Bell Lane) respectively. The school was on the east side of the Alley, near the upper end. It consisted of three converted houses, leased from John Twining (1760-1827), then an active partner in the family firm of tea merchants, to whom there is a memorial in the south gallery of St Mary's Church. The cost of the conversion was £1,800, the lease £20 per annum. By now there were 110 boys and 70 girls, of whom 30 boys and 24 girls received free clothes. The school was organised on Dr Bell's Madras system, whereby one master using pupil teachers or monitors (usually aged between 11 and 14) and more junior 'tutors' (aged from 7 to 11) could teach a considerable number of pupils. Reading, writing, and arithmetic, with attendance at church twice on Sunday, were still the main features of the curriculum. A certain amount of work was done by the pupils resulting in income. About 20% of this went to the schoolmaster, the rest into the school account which, at this time, might amount to around £135 per annum.